Do you ever feel like your life is moving at the speed of light? Are you constantly trying to 'keep up' with all of your commitments and responsibilities? As a wife, mother, and Co-Pastor of Lakewood Church -- America's largest church -- Victoria Osteen knows as well as anyone that operating in so many different roles can be extremely demanding, yet she has managed to find balance, living her life in the unforced rhythms of grace. If you ask her, she'll tell you that she loves her life and she wants you to love your life, too. 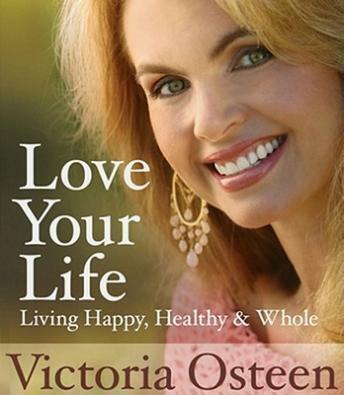 In Love Your Life Victoria shares from her personal life experiences, and her journey of faith, the lessons she's learned that have made her the woman she is today. You'll feel like you're in a conversation with a trusted friend as Victoria shows you how to tap into all that God has given you to live effectively -- as a positive influence on the world around you. You'll be inspired by stories of victory, and challenged to live at a higher level. You'll hear about people who have accomplished incredible things by overcoming their fears, and people who have changed the world around them by simply recognizing their own value. A life well lived does not come easily; you have to set out for it, look for it, and make it happen. Love Your Life tells you how to find peace, balance, and enjoyment in every area of your life: turn the challenges of each day into opportunities to love and appreciate all that you are.